It is almost dinner time and I am chopping carrots for stir fry when Tom walks though the garage door chattering away on his bluetooth. He waves and blows me a kiss as he heads into the backyard with a falcon. Another work phone call. Or so I thought. A few minutes later he is back through the door. He is trying to keep his voice steady, but his bright eyes and flushed cheeks betray him. As much as he tries to control it I can feel the joy radiating from him. D- is Tom’s best friend and has spent most of the last 6 years fighting with the 82nd Airborne in Iraq and Afghanistan. He has faced death far too many times for a young man and come through it miraculously alive, although not untouched physically, mentally and spiritually. His service term has finished and with many battle scars he is finally home for good. When I hear Tom’s words painful memories of my own best friend John, killed in Iraq on St. Patrick’s day 2007, are brought to the surface. I can still see his smiling face as he runs down the grassy field at our high school. Suddenly he springs into one back-handspring after the next without stopping until he reached the fence line where he always landed on his feet eyes wild with adrenaline. Feeling mildly disgusted as well as blissfully happy, I head back into the kitchen to wash up and find something special to make for D-. If I remember correctly, chocolate was his favorite. I began to rustle through my recipe box. Yes, here it is. A perfect choice. Preheat oven to 325F. 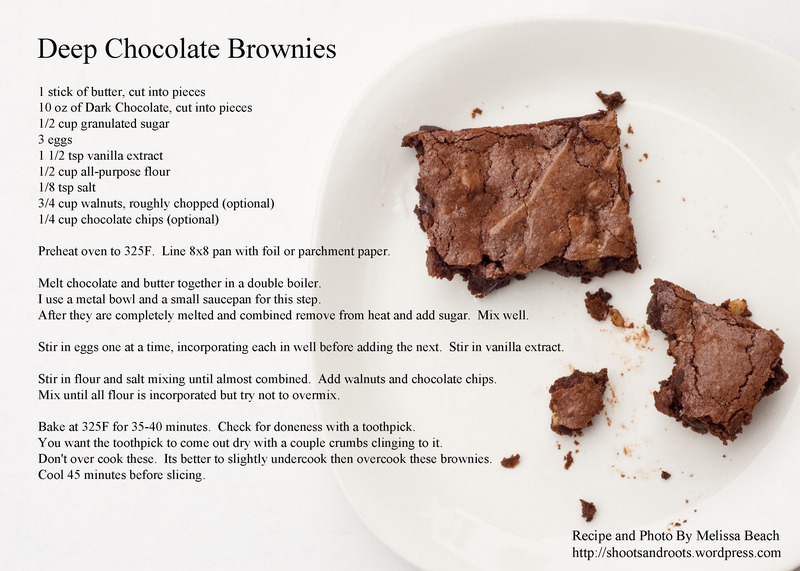 Line 8×8 pan with foil or parchment paper. Melt chocolate and butter together in a double boiler. I use a metal bowl and a small saucepan for this step. After they are completely melted and combined remove from heat and add sugar. Mix well. Stir in eggs one at a time, incorporating each in well before adding the next. Stir in vanilla extract. Stir in flour and salt mixing until almost combined. Add walnuts and chocolate chips. Mix until all flour is incorporated but try not to overmix. Bake at 325F for 35-40 minutes. Check for doneness with a toothpick. You want the toothpick to come out dry with a couple of crumbs clinging to it. Don’t over cook these. 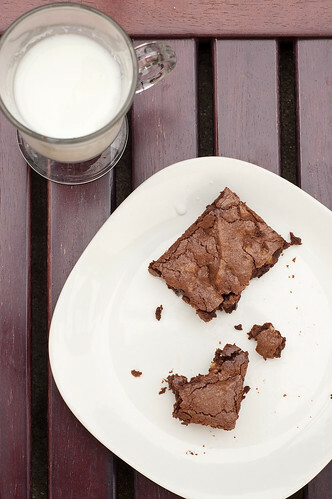 Its better to slightly undercook then overcook these brownies. Cool 45 minutes before slicing.